This blog post, by Dr Robert Ford, Dr Will Jennings and Dr Mark Pickup, is the thiry-first in a series that report on the state of the parties as measured by opinion polls. Manchester Policy Blogs will be posting Polling Observatory updates on a regular basis, alongside the well-established Ballots and Bullets blog. A more detailed introduction to the work of Polling Observatory will appear in due course. By pooling together all the available polling evidence we can reduce the impact of the random variation each individual survey inevitably produces. 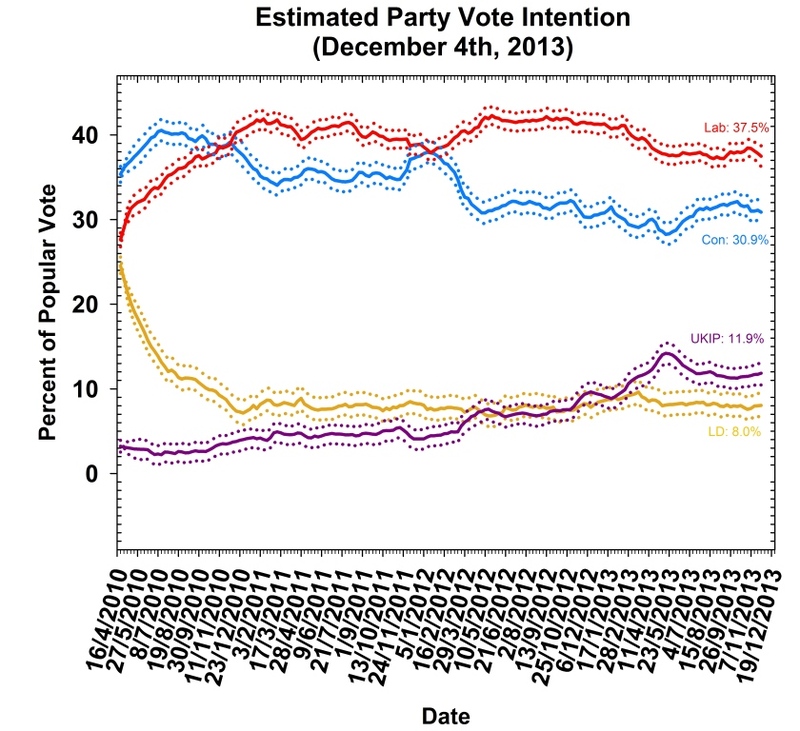 Most of the short term advances and setbacks in party polling fortunes are nothing more than random noise; the underlying trends – in which we are interested and which best assess the parties’ standings – are relatively stable and little influenced by day-to-day events. If there can ever be a definitive assessment of the parties’ standings, this is it. Further details of the method we use to build our estimates of public opinion can be found here. Both of the largest parties have had something to crow about in November – the Conservatives have trumpeted growing statistical evidence of a recovery as vindication of their economic strategy, while Labour have received a shot in the arm from the surprisingly strong response to their proposals to freeze energy bills, which have pushed the government onto the back foot. Yet our most recent look at the polling evidence suggests that, despite all the shouting from their cheerleaders, neither party has yet received any meaningful boost in support as a result of these developments. Labour’s support has fallen half a point to 37.8%, giving up half of the one point bounce we noted last month. Over the past six months or so commentators have claimed that Labour, among other things, is in crisis, is resurgent, is surging ahead, is slipping back and is melting away. Yet when the poll data is considered in the aggregate, there is almost no movement at all: Labour have been dead steady at around 37% to 38% for more than six months. The last significant shift in its support came in early spring, around the time of Margaret Thatcher’s death, when Labour lost 2 percentage points of support that they have failed to win back since. It is not clear if the Iron Lady’s demise really lead some voters to rethink their view of Labour, but it is as plausible a theory as any of the others floating around in the comment pages, and has the notable advantage of actually fitting the evidence. What little movement there is in blue support is also in the wrong direction – and our most recent estimates find Conservative support at 30.9%, down 0.9% on last month. Support for the Conservatives among the electorate has moved around more in 2013 compared to Labour, largely because of a strong link with UKIP support – when Nigel Farage’s party has been up in the polls, this has tended to hurt the Conservatives. 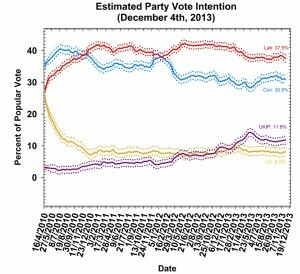 This pattern continues this month – as the Tories fall by nearly a point, UKIP have rebounded by 0.6% to 11.9%. UKIP tend to do better when immigration is high on the agenda and when Nigel Farage is highly visible in the media. Both have been the case this month, with the proposal of new restrictive immigration reforms and escalating speculation about migration from Bulgaria and Romania following the lifting of restrictions on January 1st. Mr Farage has been a regular presence across the media spectrum, weighing in on both these issues, and his party seems to be benefitting in the polls once more. The European Parliament elections in May next year will likely produce a similar virtuous circle of rising poll ratings and increased media attention. The main source of speculation regarding the Liberal Democrats continues to be whether their performance on Election Day will really be as awful as the polling suggests. The party lost nearly two-thirds of its 2010 support in the months after joining the government, and this month provides no respite. As in nearly every month since early 2011, the Lib Dems are treading water just under 10% – we have them at 8.0%, up 0.6% on last month.